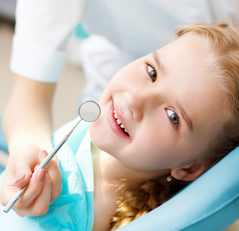 Your child's first impression of the dentist will last a lifetime. At Heritage House Dental, we want that impression to be a fun, friendly and gentle experience, ensuring good habits and a healthy smile for life. 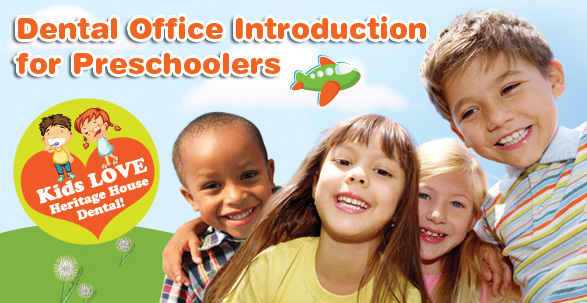 That's why we have introduced our innovative Dental Office Introduction for Preschoolers program. This is NOT a first dental exam... instead, it is a fun and positive way of getting your child acquainted with what he or she can expect when you are ready to book their first appointment. This program is geared towards children ages 2 to 4 that have never been to a dental office before. According to the Canadian Dental Association, this is the perfect age to create healthy habits that will prevent future dental problems. Sessions incorporate both children and their parents. Children will be taken individually to the treatment room where they will experience a dental setting for the first time. While Dora plays on the TV, your child will be invited to sit on the chair and be introduced to the dental tools in a friendly and non-threatening manner. Children will also have the opportunity to try on the protective glasses, put on a bib and lay back in the chair as they would during their first visit. After this session, you child will be rewarded with a toy, a sticker and a loot bag. These activities will be geared toward dental education in a fun and engaging manner. Before going home, all kids will receive a balloon too! Our Dental Office Introduction for Preschoolers program is a positive and fun experience that kids love. More importantly, it sets the standard for a lifetime of good oral health. Best of all, it is absolutely free. Call us at 905-814-1600 to book a session for your child.